In the early 1980s I finally had the opportunity to visit the Glacier Peak Wilderness. 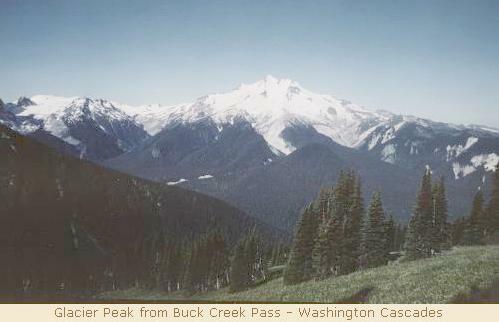 I had pored over maps of the area for years, and I took the chance in mid-September of 1981 to visit Buck Creek Pass. My trip was delayed a week by my workload, and I watched in dismay as the last good weather slipped from my grasp. My hiking-partner Jeff was ready for either week, so we headed over Stevens Pass to camp near the mining-town of Trinity at the edge of the wilderness. The weather wasn't bad for our first day, but it was far from clear. We hiked through the mining town and up the Chiwawa River toward the pass, taking a leisurely pace. By midafternoon the clouds were dropping and we reached a camp area that was in a dense clump of fir-trees well below the pass. We set up a nice camp and started a fire to drive out the cool dampness from our site, but all around us was falling victim to a cold rain. A few deer drifted into our trees, saw us and moved on. While we slept, the snow level dropped nearly to our camp! We awoke to wet snowflakes, which helped us to decide that we would not camp higher that night. Instead we rigged up daypacks and headed up to the pass through somewhat thinner but still threatening clouds. When we reached the pass we were standing on about eight inches of fresh snow, and flurries were adding slowly to the total. We could only see a mile or so in any direction, so I snapped a photo in the direction I thought the mountain was. We looked around for a while, then retreated to the campfire and another night's rest. Day three was just as cloudy and our boots were wet, so we retreated back to the car. A few rain showers kept us moving, so we were out fairly quickly. It was an adventure, but I really wanted to see Glacier Peak. Less than a year later I returned to Trinity with another hiker, and we cruised up to the same camp spot again. Clear skies and warm weather were with us, and the next day brought us to Buck Creek Pass and its marvelous views. Glacier Peak dominates the skyline (only about 90 degrees left of where I thought it was during the snowstorm! ), and other local peaks were also impressive. We hiked out to Flower Dome, a high hill that earned its name, and camped at the pass that night. At sunrise we packed up, explored the trail toward Little Giant Pass, took a few more pictures, and headed back to the car. This loop clearly works well for a two- or three-day trip, and the trail can't even be lost in eight inches of snow, so it's easy to recommend for nearly any level of experience.